Chocolate Tasting Parties by DOVE Chocolate Discoveries! Chocolate Tasting Parties - Fun Time! Chocolate tasting parties are so much fun! Ladies sample everything from Chocolate martinis, to easy, elegant chocolate mousse, truffle fudge brownies, fondue and ready to eat items! All made with 100% cocoa butter. Now, that's my kind of party! :) It definitely sounds like a very indulgent and fun way to market the Dove Discoveries products. I'm surprised no one's thought of it sooner. I think if I was a Dove rep, I'd be growing by leaps and bounds whether my business did or not. Grin! I hope you do really well with this. It sounds like a definite winner! 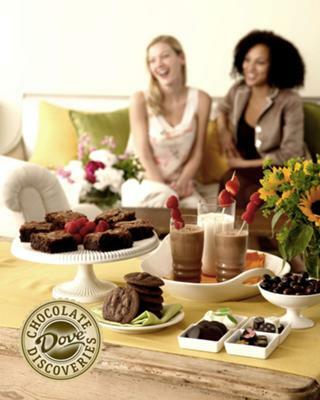 Comments for Chocolate Tasting Parties by DOVE Chocolate Discoveries!
" Its Our Sweet Life".